Celery: chew on a celery stick and you can feel it break down into fibrous strands. 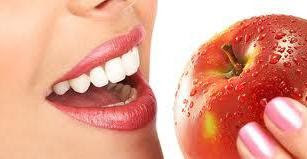 The chewing action is a little gym-workout for your gums, and the saliva produced in the process cleanses the mouth. nd they’re rich in antioxidants and vital nutrients, too. Clove (oil): clove is a time-tested spice that improves oral health. Chewing on a stick of clove when you have a toothache brings relief from the pain. And if you mix a couple of drops of clove oil in a cup of warm water and gargle with it, you’ll do your mouth a big favor—clove oil reduces gum inflammation, zaps away bacteria and freshens breath. Sesame oil is another powerful mouth healer. Cheese: it contains a milk protein called casein, which strengthens the surface of your teeth. Plus it’s low on acid and sugar and high on calcium. Not to mention delicious! The ideal cheese for healthier teeth: aged parmesan. Yogurt: plain yogurt is indeed a star when it comes to smile-enhancing foods. It has casein and calcium aplenty. Besides, yogurt helps improve digestion, which in turn gives you fresh breath.